BOSTON, MA, September 5, 2018 – Vertical Systems Group’s Mid-Year 2018 Global Provider Ethernet LEADERBOARD results are as follows (in rank order based on retail port share): AT&T (U.S.), Colt (U.K.), CenturyLink (U.S.), Orange Business (France), BT Global Services (U.K.), Verizon (U.S.) and NTT (Japan). The Global Provider LEADERBOARD, the industry’s benchmark for multinational Ethernet network market presence, ranks companies that hold a 4% or higher share of billable retail ports at sites outside of their respective home countries. Port counts include switched Ethernet, Ethernet Private Line (EPL), and Ethernet Virtual Private Line (EVPL) services, as well as Ethernet access to Cloud/Internet, MPLS and other VPNs. The Challenge Tier of Global Providers includes companies with share between 2% and 4% of this defined market. Seven companies qualify for the mid-2018 Challenge Tier (in alphabetical order): Cogent (U.S.), Global Cloud Exchange (India), SingTel (Singapore), T-Systems (Germany), Tata Communications (India), Telefonica Worldwide (Spain) and Vodafone (U.K.). AT&T is the first U.S. company to attain the top position in the Global Provider LEADERBOARD. AT&T increased its rank to first position from second at the end of 2017. Orange Business drops from first to fourth position as a result of slowing growth in its global Ethernet business. The perennial leader in this market segment, Orange had previously attained first position on every year-end Global Provider LEADERBOARD since 2009. Colt moves into second position, up from third at the end of 2017, with the integration of its Asian operations (via its KVH acquisition) and pan-European network. CenturyLink advances to third from fourth position due to Orange’s fall, and boosted by Level 3’s assets outside the U.S. The Market Player tier includes all Global Providers with port share below 2%. Companies in the Mid-year 2018 Market Player tier are as follows (in alphabetical order): Bell (Canada), Bezeq International (Israel), CAT Telecom (Thailand), China Telecom (China), Chunghwa Telecom (Taiwan), Eir (Ireland), Embratel (Brazil), Epsilon (Singapore), euNetworks (U.K.), Exponential-e (U.K.), Globe (Philippines), GlobeNet (Brazil), GTT (U.S.), HGC Global (Hong Kong), Indosat Ooredoo (Indonesia), KDDI (Japan), Korea Telecom (Korea), KPN International (Netherlands), Liberty Global (Netherlands), Masergy (U.S.), PCCW Global (Hong Kong), PLDT Global (Philippines), Rogers (Canada), Spark (New Zealand), Sparkle (Italy), Sprint (U.S.), StarHub (Singapore), Telekom Malaysia Global (Malaysia), Telia (Sweden), Telin (Singapore), Telkom South Africa (South Africa), TelMex (Mexico), Telstra (Australia), Zayo (U.S.), and other providers selling Ethernet services outside their home country. 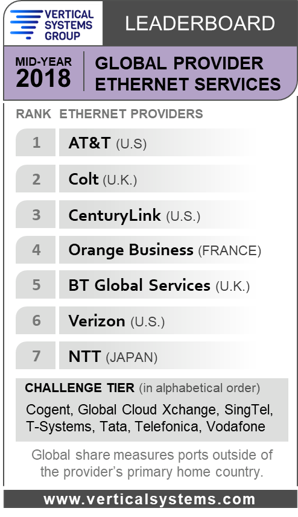 Global Provider Ethernet LEADERBOARD: AT&T, Colt, CenturyLink, Verizon. Challenge Tier: Global Cloud Xchange, SingTel, T-Systems, Tata, Telefonica, Vodafone. Detailed Ethernet share results that power the Mid-Year 2018 Global Provider Ethernet LEADERBOARD are available now exclusively through Vertical Systems Group’s ENS Research Program subscribers of @Ethernet. Contact us for subscription information and pricing.